I drove into Bamako during rush hour yesterday. While I was dogging motorcycles and yelling at cars – I’ve seen some interesting driving styles lately – I noticed that “total distance = 8000km” had appeared on the screen of my cycle computer. Time for a break! 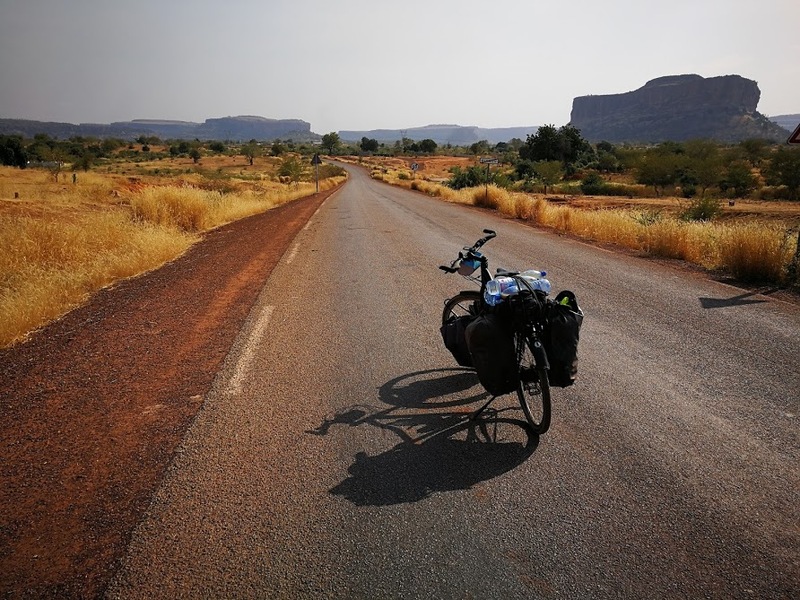 Cycling from Dakar to Bamako has been great. The countless baobabs were hypnotizing and every tree has its own unique shape. The scenery was breath taking, but it’s the people of West Africa that have impressed me the most. 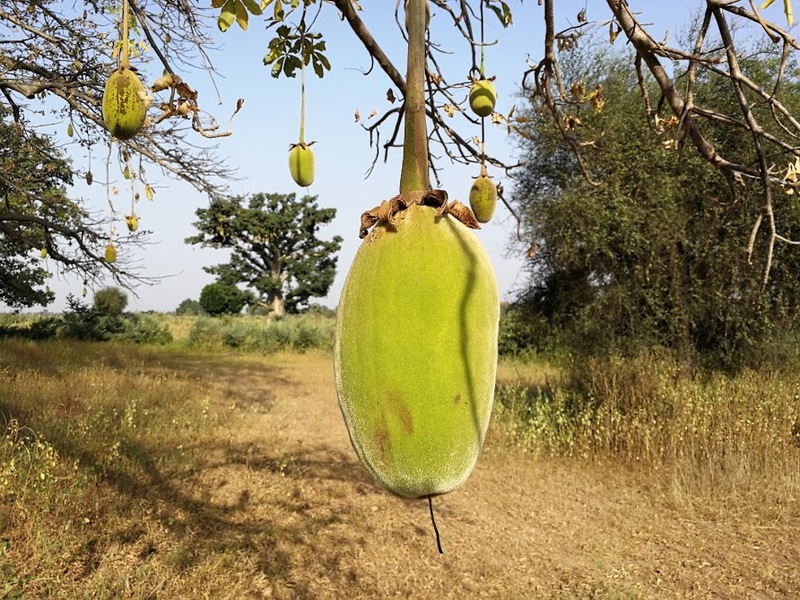 Hospitality in rural parts of Senegal and Western Mali is endless, and little villages feel very warm and welcoming. Sometimes I feel like I’m living in a dream. My life consists of cycling on beautiful sand roads, surrounded by colorful birds, meeting people with great stories, and waving at children. 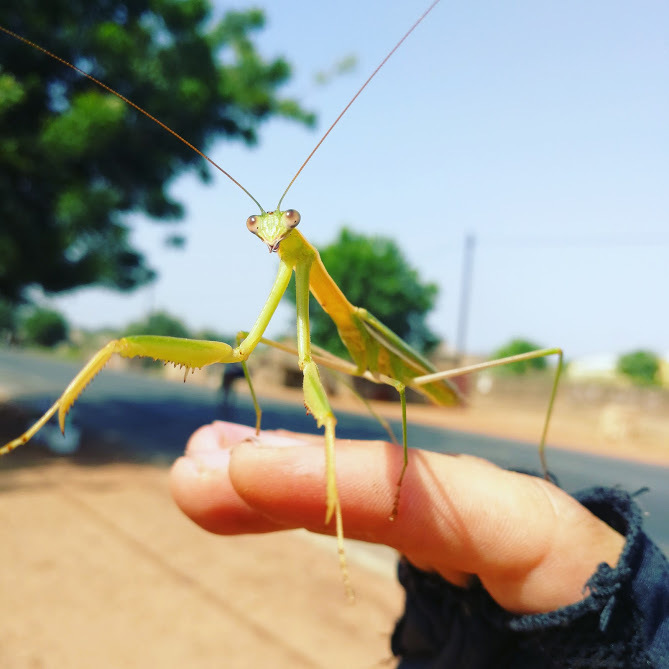 From Dakar I cycled East. I met Thierno and Mohammed in Bargny. I drove to Touba – the holy city of the mouride brotherhood. I passed by a lot of baobabs. I met Fadoua and Mohammed – a Tunisian couple who are walking (!!!) around the world. I had more “théboudienne” at the local office of the ministry of agriculture. I tried to hide from the heat in boutiques along the N1 towards the Malian border. I accidentally crossed the border into Mali without officially entering. 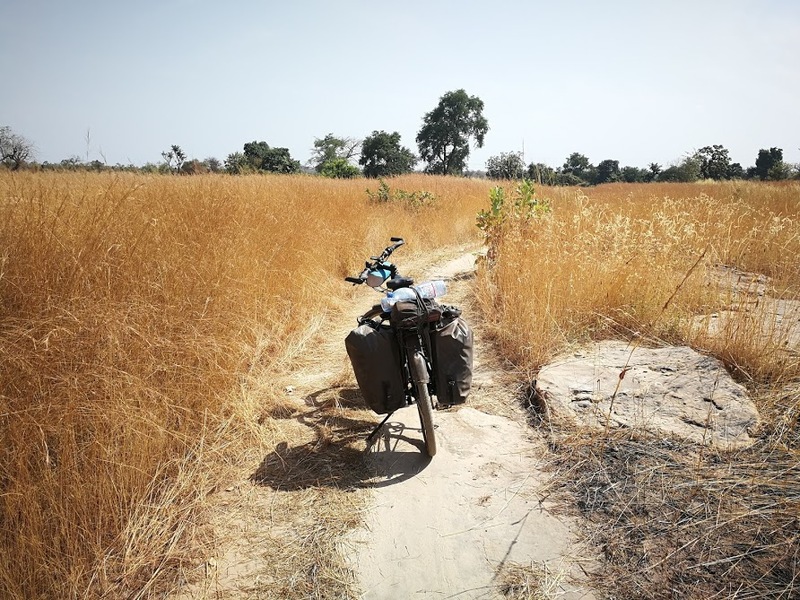 I cycled straight through the jungle and the savannah in Western Mali and broke the front gear of my bike. I arrived in Bamako and I’m staying with the Diakité’s. Issa (another friend of Mohammed – “Issa” means Jesus in Arabic btw) and two kids I played football with. After a good night of sleep at Mohammed and Thierno’s place, I did feel like cycling! 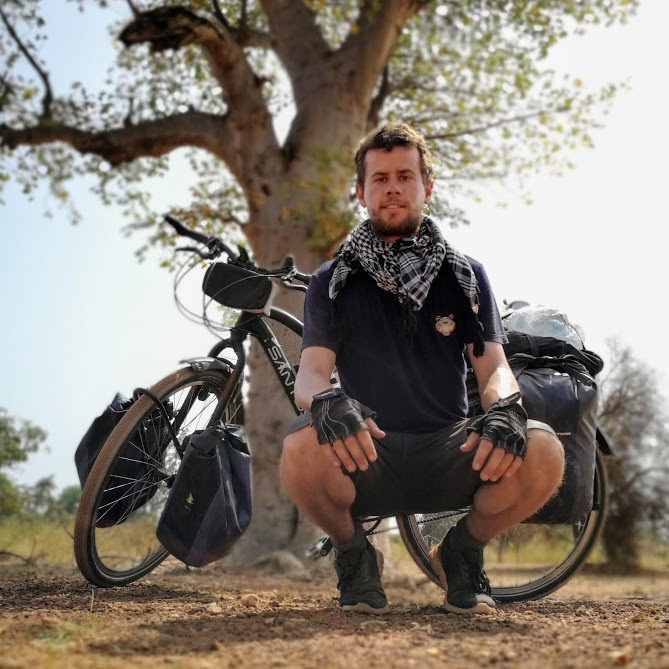 For the next three days I cycled on dirt roads with Baobabs on both sides, and I camped wild at night. A lot of thorny plants grow on the side of the road, and I had ten punctures in three days as a result. The temperature was over 40° every day, but it didn’t feel as hot as the Sahara thanks to the shades of the baobabs. 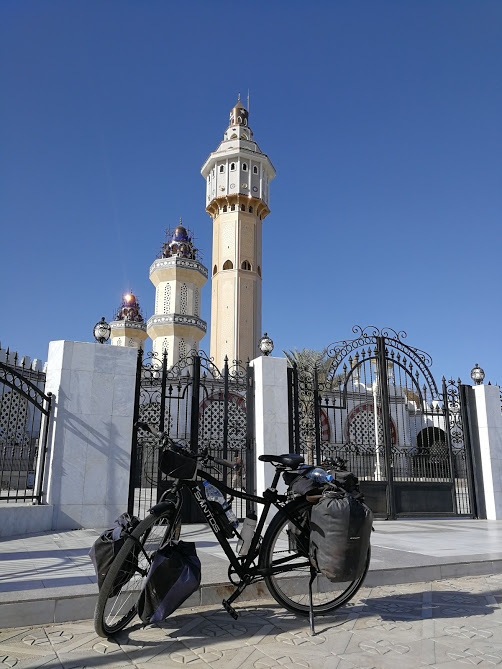 On Wednesday 25 October, I arrived in Touba, the holy city of the mouride brotherhood. 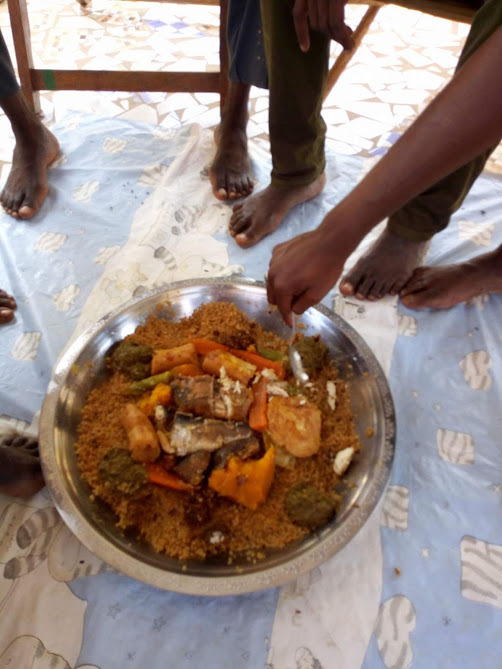 Everyone was preparing the “magal” of Touba, an annual celebration during which millions of pelgrims of the Mauride brotherhood celebrate the life and teachings of Cheikh Amadou Bamba, the founder of the brotherhood. Touba is all about Mauride islam. Within the city walls it is not allowed to smoke in public for example, because smoking is not sharia compliant. The man on the right with the hat is called Omar. The other men joined for the picture :). 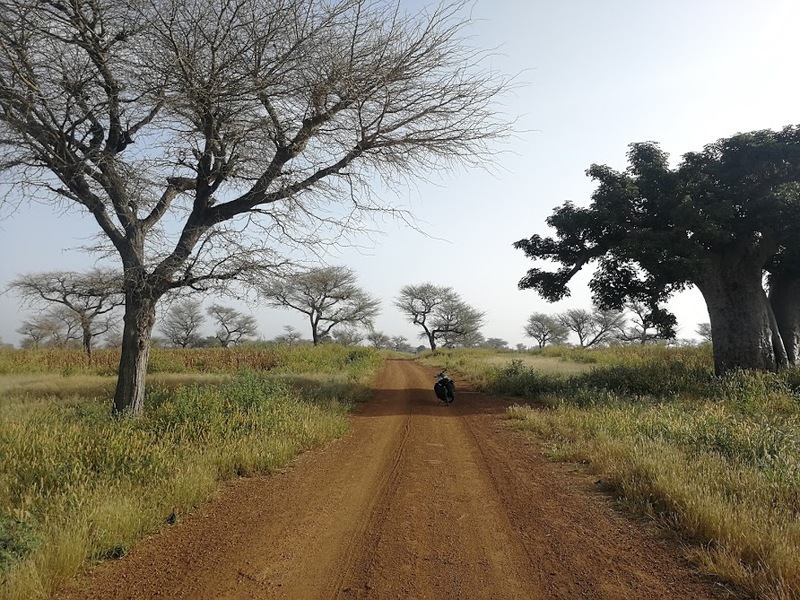 When I left Touba, I decided to find an asphalt road towards Tambacounda. Mostly because I wanted to avoid more flat tires. I cycled South towards Kaffrine to take the N1. 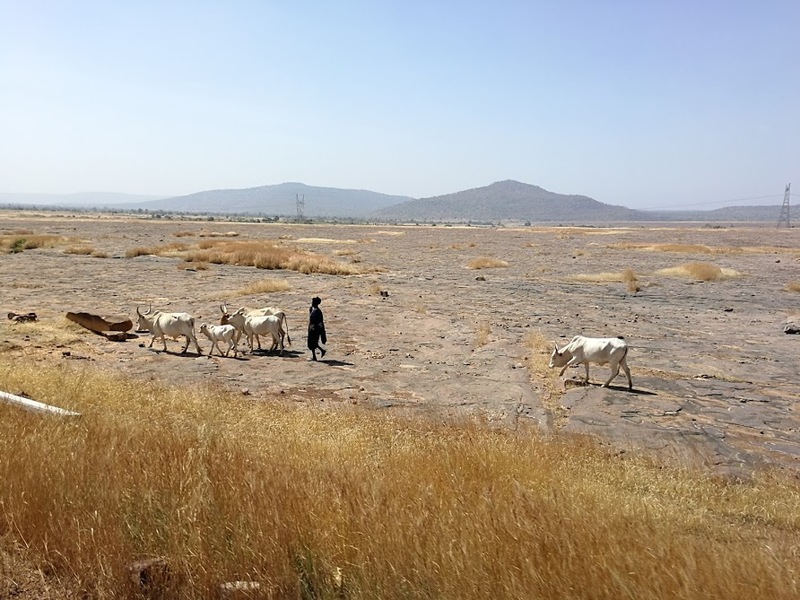 Even though this is the main road towards Bamako, there’s is not a lot of traffic. 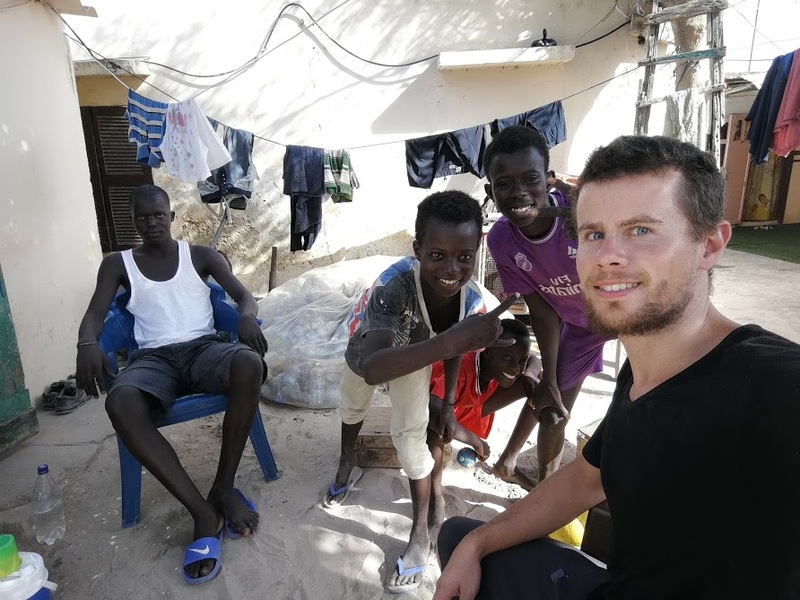 The next day – Friday 27 October – I met Fadoua and Mohammed. 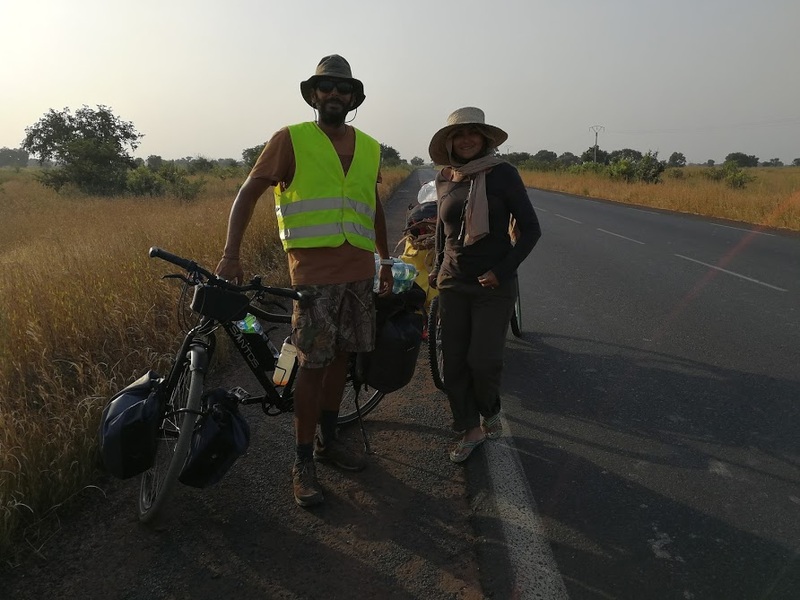 Fadoua en Mohammed are a Tunisian couple who are walking around the world. They also quit their job to realize a lifetime dream, so we got along immediately. Mohammed had just come up with the idea to use a pedal boat to cross the Atlantic. I could feel Fadoua wasn’t so sure about it… You guys blew me away!! The next day, Babacar Badji invited me for lunch at the local office of the ministry of Agriculture. 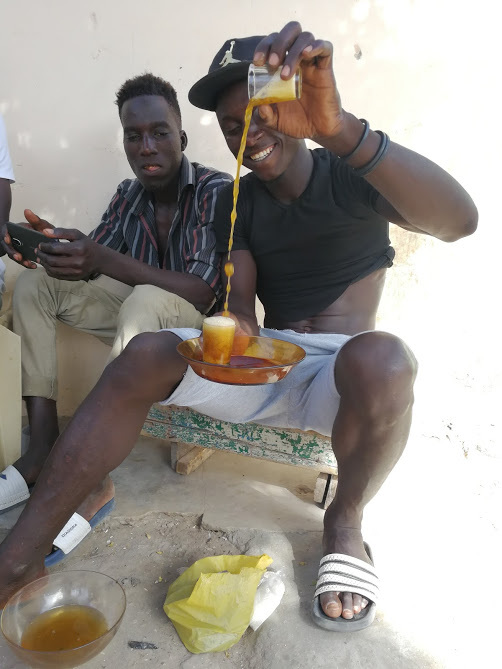 We had théboudienne with his colleagues and listened to French rap music until tea time. 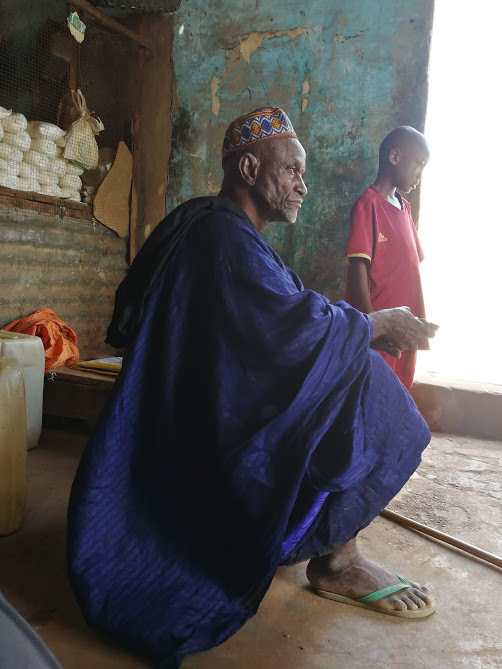 When I left, Babacar and his colleague, Baye Déthié, offered me a turban to protect me from the sun. I love it! It keeps my brain cool, and it looks better than wrapping a T-shirt around my head. 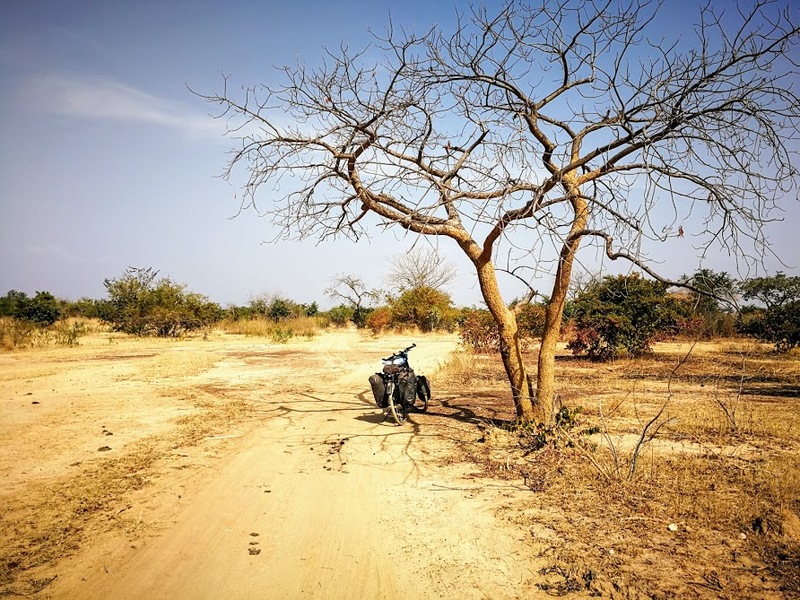 East of Tambacounda, along the N1, I stopped regularly to avoid the heat in the afternoon. My favorite place in the shade are the “boutiques” – small stores that sell everything from water to phone credit – you can find in every village. Boutiques also function as hangout places for locals. There aren’t any bars or tea houses outside of the larger cities, so you find people making tea in front, or inside, of the town’s boutique. I spent many hours hanging out in boutiques, just talking about life, cycling, menstrual hygiene management, and drinking tea. A man and a boy in a boutique. 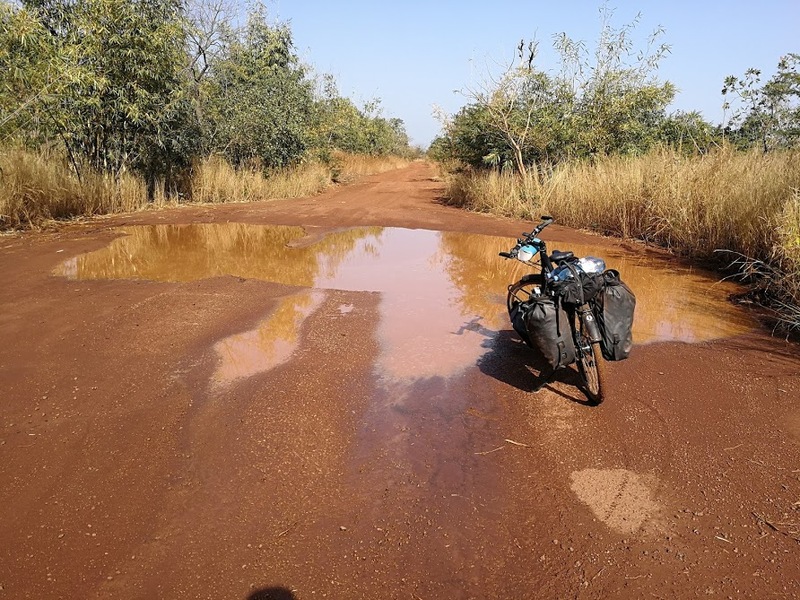 I found out that the road surface of the N1 is awful East of Tambacounda. 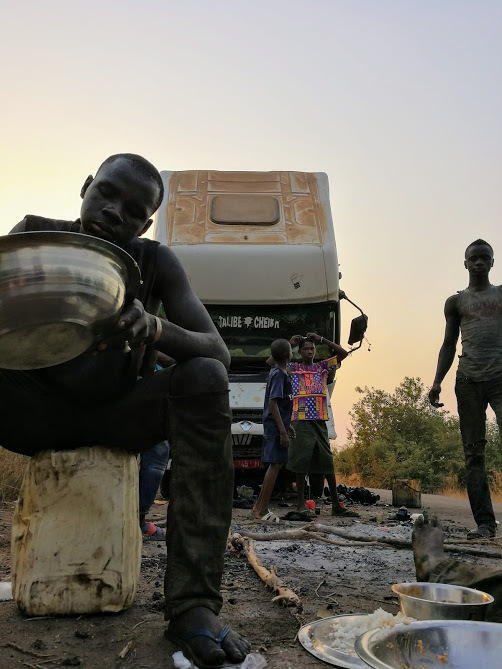 90% of the traffic there are trucks that transport goods and petrol from the port of Dakar to Kayes, or Bamako, in Mali. Because the road is so badly maintained, a lot of trucks break down. 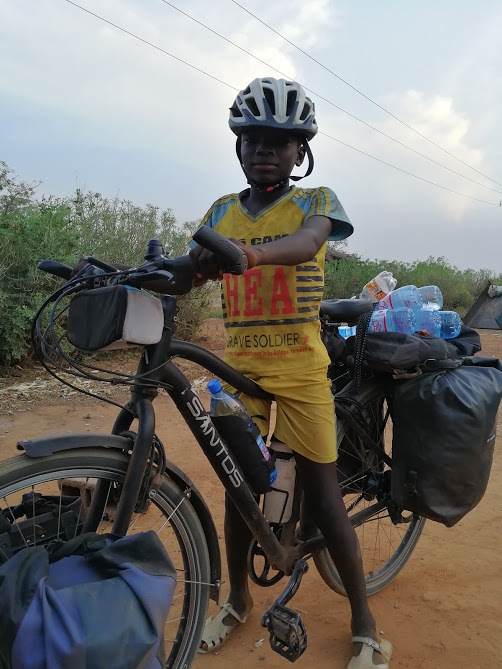 Close to Goudiri, Brahim asked me for water when I cycled by the truck he was trying to repair. I gave him all the water I could miss. Brahim is a mechanic who works in Kayes. 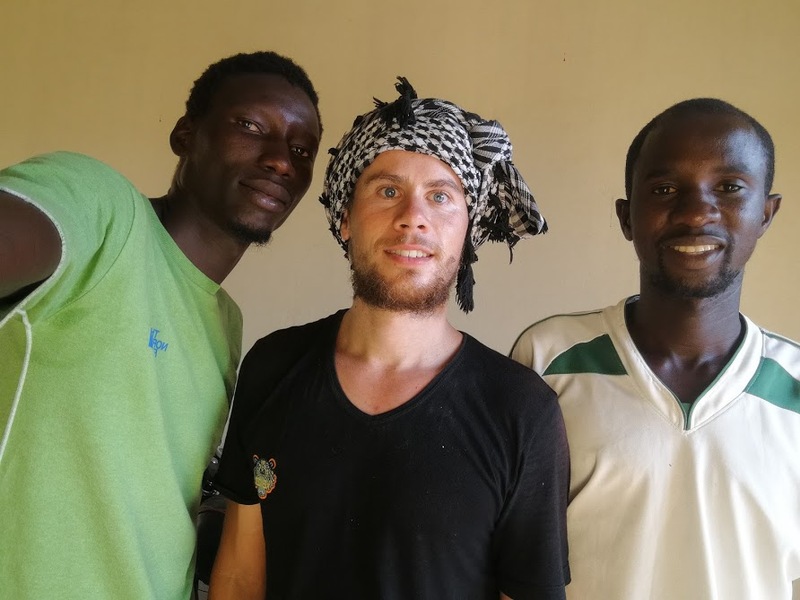 He and Biram, who assists him, drove 180km to repair a truck that had been stuck for three days. 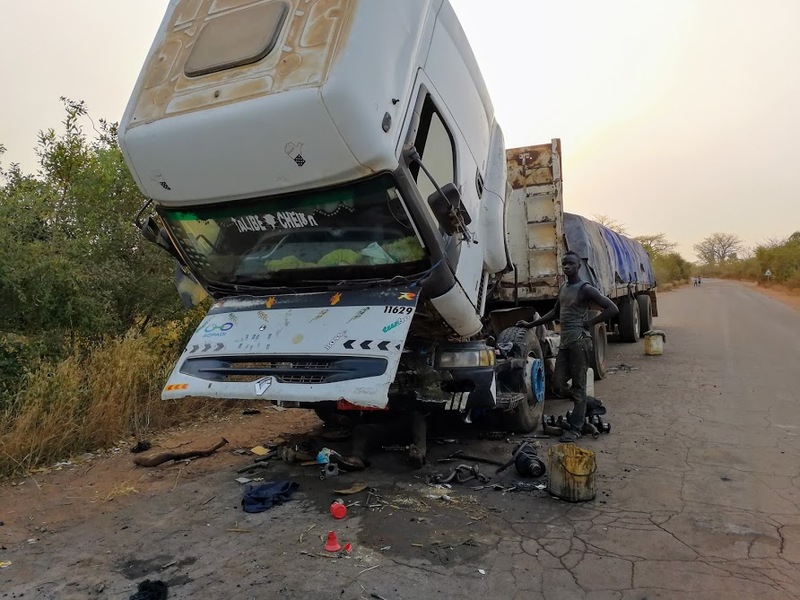 The driver, Badji, had tried to fix the engine himself for three days without any success. Brahim’s feet are visible under the engine. Brahim told me that they sleep on top of the truck at night, and asked me if I wanted a spot as well. There are wolves and hyenas in the jungle, so I happily accepted and joined for dinner. 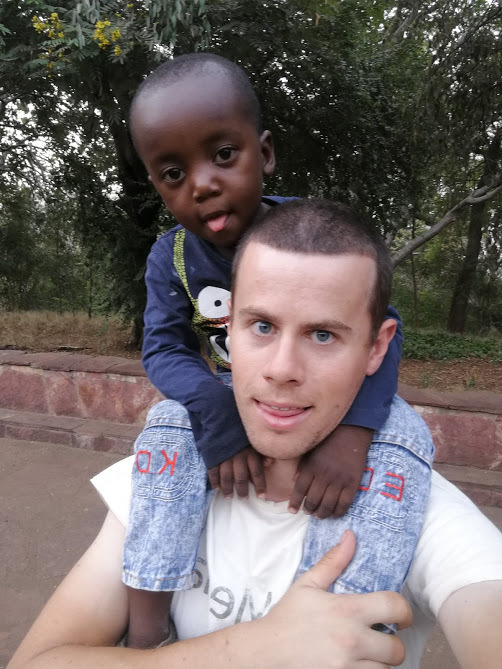 The next day, Wednesday 1 November, I arrived at the border with Mali in the afternoon. In stark contrast to the corrupt Mauritanian border officers I had to pay, the Senegalese border officers were helpful and friendly. 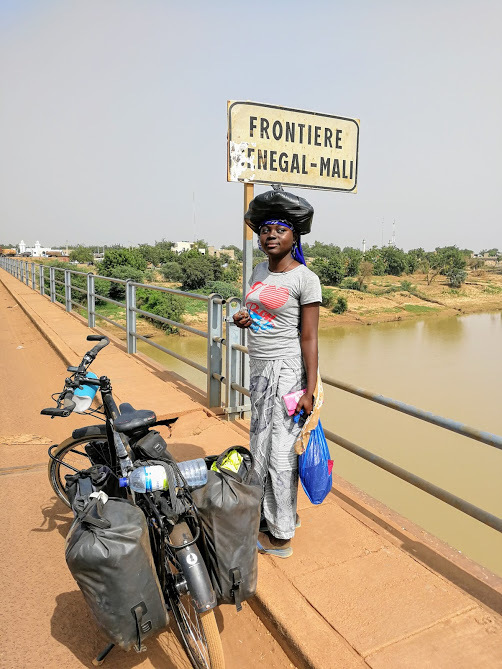 I obtained an exit stamp easily, and I walked across the bridge over the Senegal river into Mali. 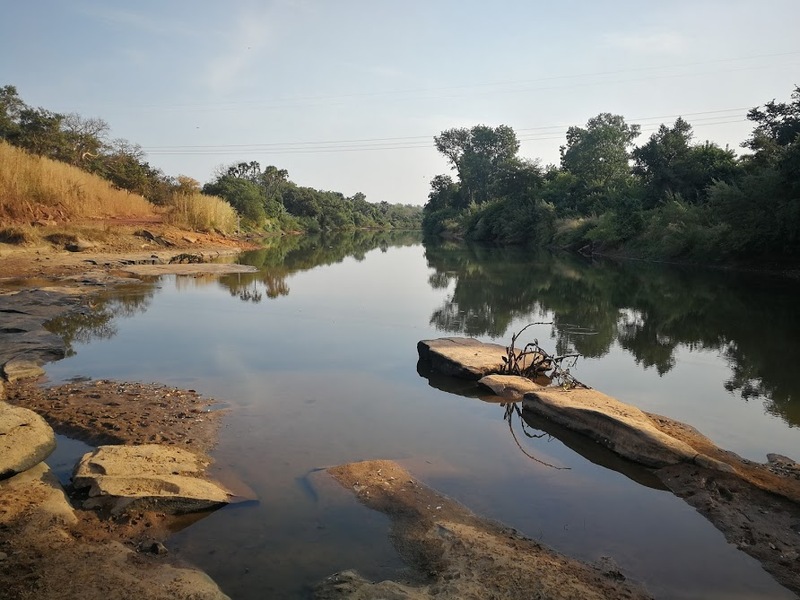 I stayed in a hotel at the Malian side of the river, because it was already getting dark. 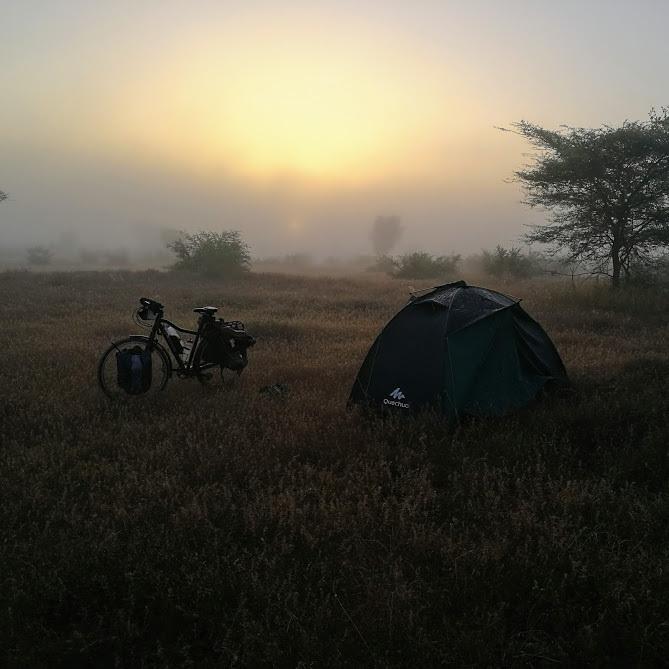 The next morning, I started to cycle East. 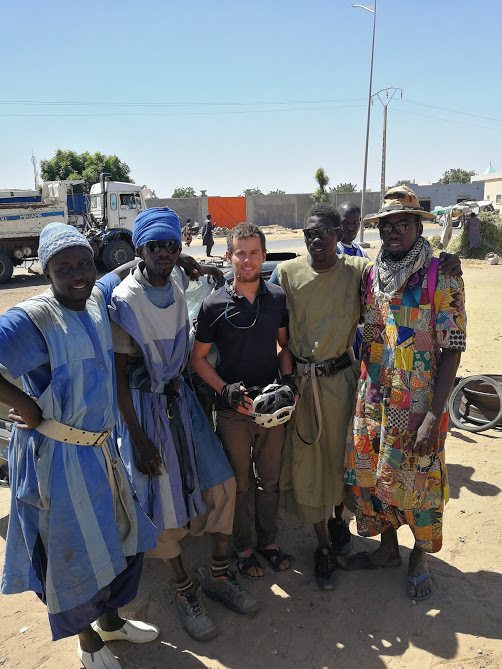 I was expecting to be stopped by the Malian police (no Malian had checked my passport yet). 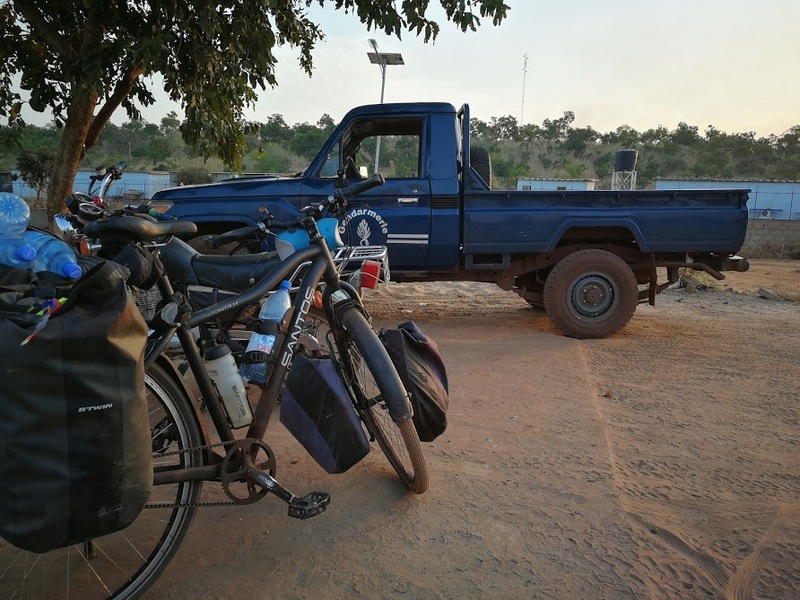 To my surprise I didn’t see any police officers that morning, so I effectively cycled 90km into Mali without officially entering… To avoid issues later on, I went to the special police in the first city East of the border: Kayes. After filling out some forms, I finally obtained an entry stamp in my passport. Myriam walked with me to the other side of the bridge on her way to the market. She asked if she could be in my “border picture”. Of course! 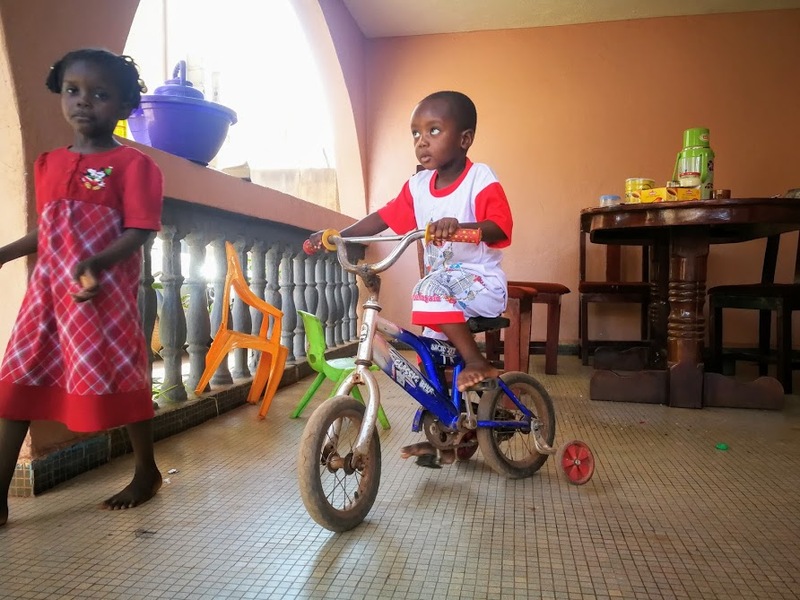 In Kayes, I stayed with Ousmane Coulibaly and his family for a day. Ousmane works for the German international cooperation (GIZ: Deutsche Geselffshafft für Internationale Zusammenarbeit), and has been following my journey for a while. This is how I know him:. Do you remember that I stayed with Ewald and Béatrice in Kehl near Strasbourg? (see #6 Damme – Zurich) Ewald is also involved in the GIZ. 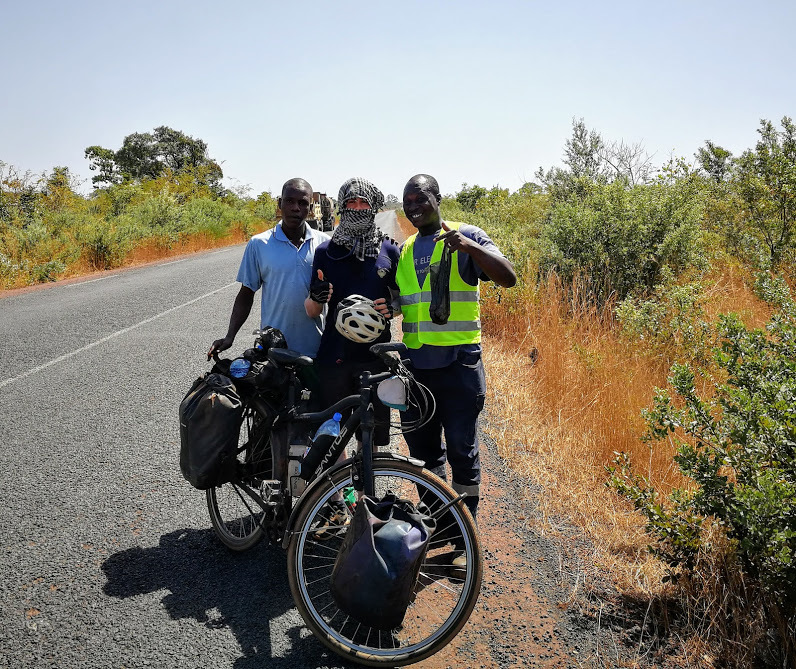 Ewald informed a Malian friend who works at the GIZ office in Bamako, Amadou Diakité, who was charmed by my little cycling journey. 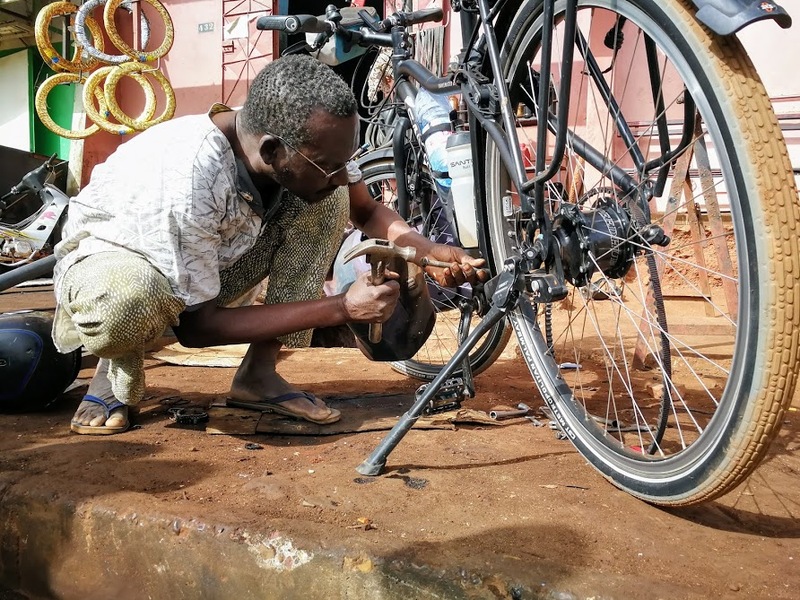 Amadou contacted me when I was cycling in Morocco, and invited me to stay with his family in Bamako. I was delighted and happily accepted. Meanwhile, Amadou told his colleagues at the GIZ about me, and Ousmane Coulibaly who works at the regional office in Kayes also learned about “road to cape town”. I like how the dots connect :). 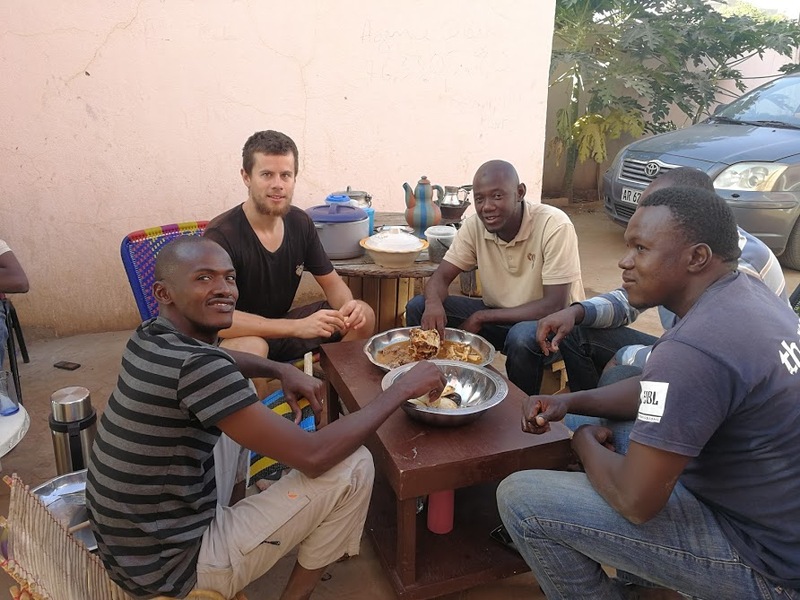 Ousmane invited his brother and two of his colleagues for breakfast. I dare to say that I’m comfortable with cultural differences. My first time “tête de mouton” at breakfast, however, did come as a shock. I needed 10 minutes to overcome the visual strangeness of this dish, but it tasted really good. Also, I believe that eating every part of an animal is the most respectful, because no meat is wasted. So I’m a fan! “tête de mouton” at breakfast. Ousmane is sitting on my right. 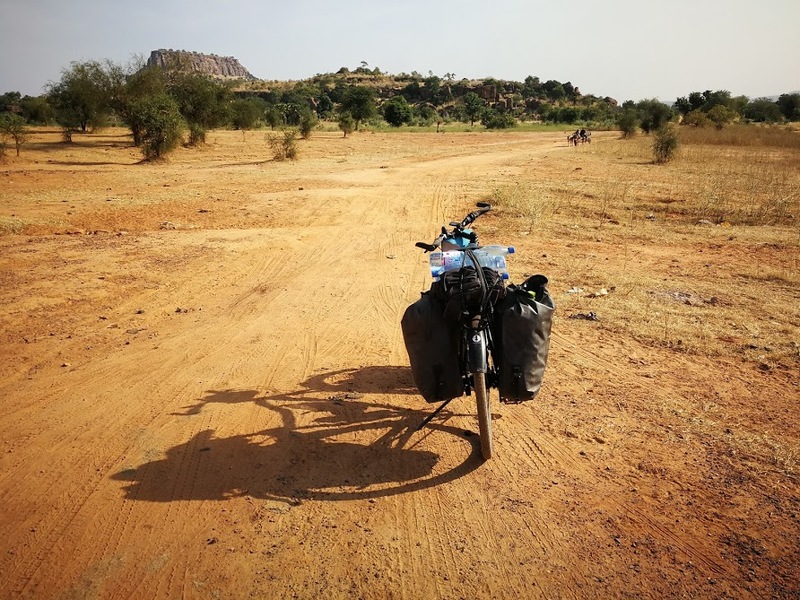 During my stay in Kayes, I was told that the main road that goes North-East, or “route du Sahel”, is not the best way to go to Bamako. 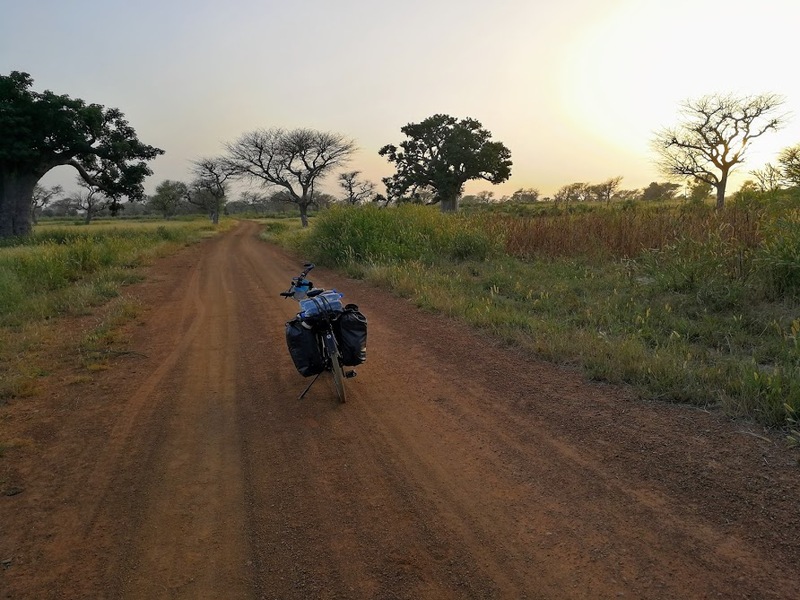 So I cycled along smaller roads South-East in a landscape that alternates between jungle and savanna. 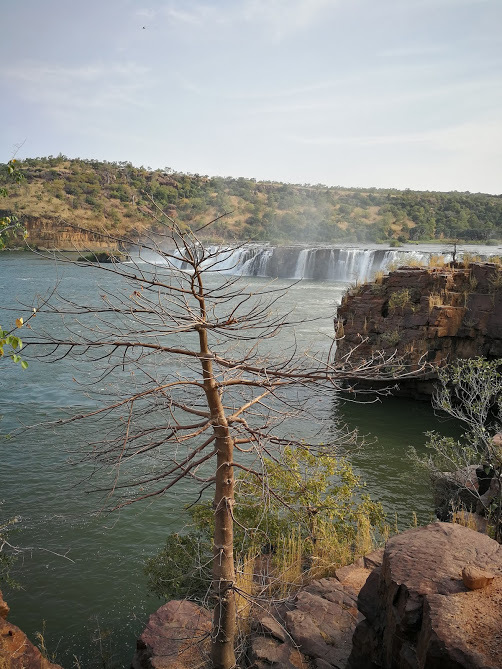 The views in Mali were the best so far. That night I stayed at a police post next to a compound for Chinese workers in Guinéa. 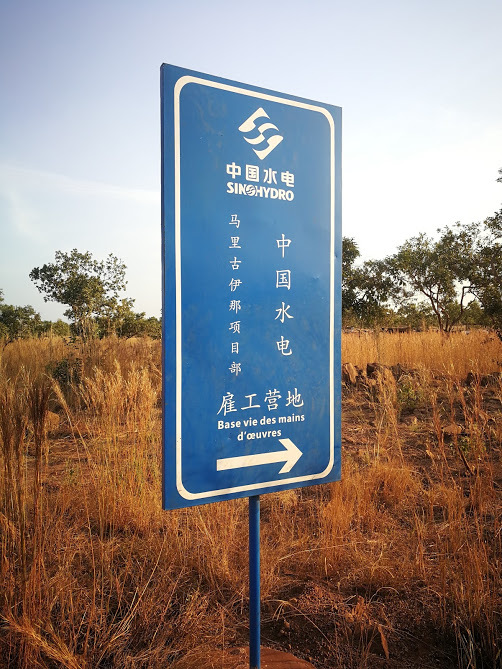 “Sin Hydro” is building a hydraulic electricity plant here. I watched football: Barcelona – Sevilla with five Malian police officers. The next day I got lost. I wanted to go to Bafoulabe, and I was convinced that there was a road, but somehow I ended up on animal tracks. The animal tracks slowed me down but I didn’t mind. I felt like Simba playing in the long grass and I loved the view. Eventually, after a lot of detours, I did arrive in Bafoulabe. Covered in sand of course. 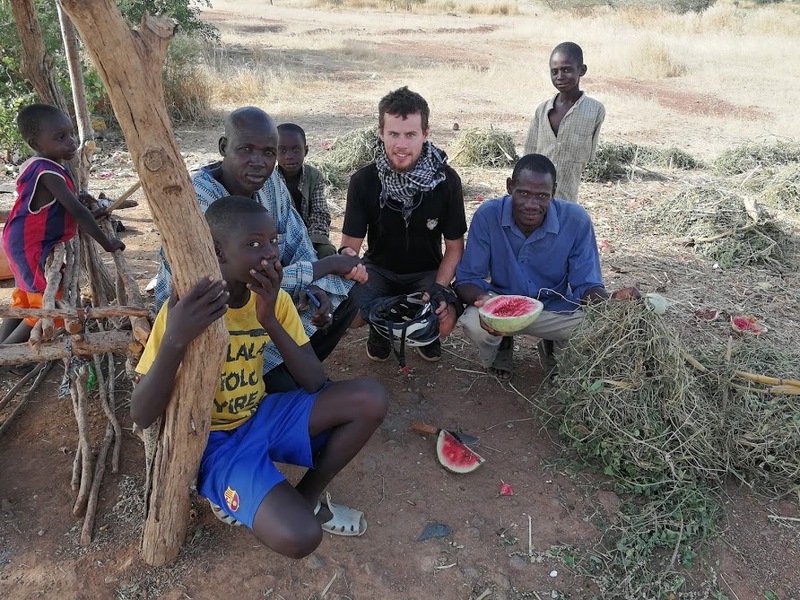 During the 6 days from Kayes to Bamako I spent 3 nights on the property of locals. I just show up at nightfall and ask “can I camp next to your house”? Usually, the person to whom I ask that question takes me to the father of the family, and so far I only had “yes” as an answer. I usually drink tea with some of the kids until I feel sleepy. 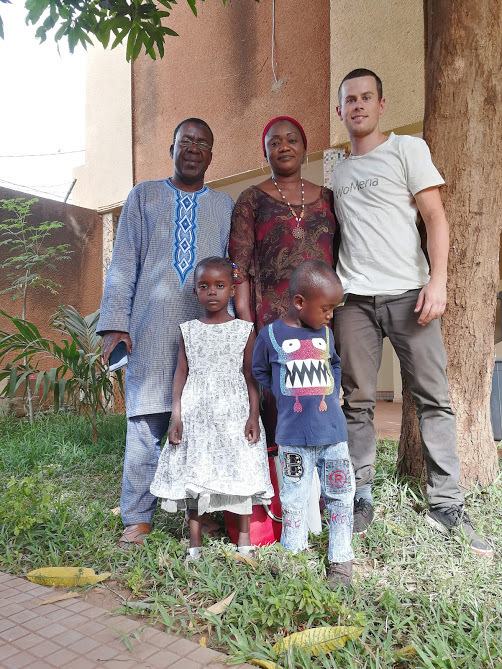 I am now staying with the Diakité family in Bamako. I am very thankful that they offered me a bed! I am happy to rest for a couple of days, and to catch up some sleep. It has been a great, but exhausting stage. I’ve been visiting the city of Bamako. My hosts Amadou and Angèle are showing me around. Meanwhile, I’m preparing the route for what lies ahead, and making sure my bike is ready again. left to right, the Diakité’s: Amadou, Kadi, Angèle, Masemba. Walking with Masemba in the park. Ongelofelijk knap wat je tot nu toe hebt gedaan ! hoop ook dit tot een goed einde te brengen! heb er alleszins veel zin in. Salut, je suis devenu ultra fan de ton histoire. Je viens de terminer la dernière et je n’attends qu’une chose: la suite de tes aventures. heel blij te horen dat ik jou als fan heb, ben vereerd ! hopelijk gaat alles goed! Wanneer ik terug ben komt er zeker een debriefing ;). Hello Stijn, after drinking liters of tea, you’ll progressively enter countries where they drink beer. Happy guy! Following you from Singapore…and wishing you a safe journey! Kijk al uit naar de volgende aflevering !